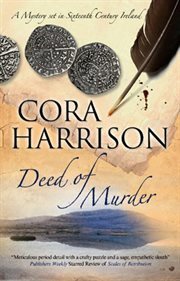 The item Deed of murder, Cora Harrison, (ebook) represents a specific, individual, material embodiment of a distinct intellectual or artistic creation found in Charlotte Mecklenburg Library. The enthralling new Burren mystery . . . April 1511, Ireland. Mara, Brehon of the Burren, is celebrating the christening of her son when she notices that three of her law students have disappeared from the party. The next morning, one of them is found dead on a lone mountain pass with suspicious wounds. He was carrying an important legal document that has now disappeared. But why did he choose to deliver it during the night, and what of the two other missing students? Mara must uncover the truth - and it at first seems that the stolen deed holds all the answers . .